With spring comes some unfortunate winds that might cause you to rethink your plans. Luckily, there are some ways to make the best out of windy days, so you won’t have to feel like you’re totally confined in the home. Many of these ideas will help you keep your children entertained, so you don’t have to worry about them bouncing off the walls if extended outdoor play simply isn’t an option. So, don’t let the downside of spring weather bring boredom, because there are so many ways you can find joy in a windy day without spending a small fortune. You might even start a new Big Wind Day tradition that everyone will look forward to. When it comes down to it, flying kites and windy days go hand in hand. This classic childhood activity is one of the best ways to help your children get more out of windy days. You have a lot of options when it comes to kites too. You can purchase some cheap kites at department stores if you simply want to jump into the activity. On the other hand, you can also spend some time building your own kite. This is a perfect idea for days that might be a bit too windy to enjoy outside. 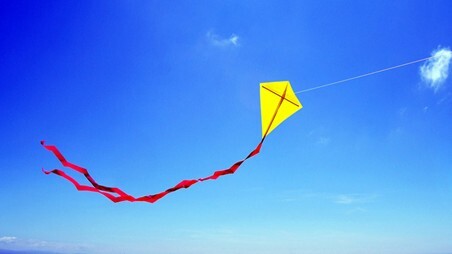 There are lots of tutorials online that can help you get a jump start on making a basic kite for the family to enjoy. This activity will certainly keep everyone busy for hours, which will definitely help ease the tension of windy day plan changes. Paper airplanes might seem like a take on the kite, but you can enjoy a lot more options when working with this medium. For instance, you can look up origami tutorials online, so you can make more than just the classic paper plane. You can also hold a competition to see which airplane can fly the furthest when you do take the planes out to give them a try. If you want to get more out of this craft, then use papers infused with seeds. This will help do right by the environment while still allowing you to have some fun. You might also consider writing positive messages on the airplanes to bring hope to other people. If your children choose not to let their planes loose, then you can always use the fun paper craft as a bit of décor for their bedroom. When you’re feeling crafty and the weather is windy, nothing eases your need to create quite like making a windchime. This craft can be done in so many ways, which makes it the perfect option for all ages. You might have kids go on a scavenger hunt around the home to find all of the things they can use to make their chimes. Part of the charm of the craft is banging things together to experience the sounds they will create. Once you have the noise element of the design ready to go, you can easily enjoy adding personality to the design. You can use old toys, pictures, shapes, beads and anything else you find. When the chimes are complete, hang them outside and listen to the symphony of their music. You might find that it truly does make a sound that you’ll long to listen to all year long. If you want to teach your children more about the wind, then a wind sock is a great way to keep them occupied. You can make a wind sock out of just about anything too, including an actual sock. However, one of your best options is to use some old fabric for the trick. Recycling fabric is a great way to make the craft ecofriendly and fun. You can decorate the wind sock in any method that you choose to, which will help keep children busy for quite some time. When the sock is finished, hang it outside or place it on a pole and then watch it move. Children can observe the direction of the wind in this manner. They can also make journals about the change in wind direction to watch for patterns and so much more. Watching the clouds is a lot of fun any day of the week. However, it can be a lot more exciting when it comes to windy days. This is largely because the clouds move much faster than they normally would. Kids can observe the difference in the clouds and make notes of them. On top of that, they can enjoy the tranquil nature of the clouds passing over head. Another great thing to incorporate into cloud watching is also racing. Everyone can choose one cloud and watch it pass by to see which cloud is going the fastest. Kids will love the competition while also finding joy in the changing world. You can safely do this activity from inside the home or vehicle, especially if the wind is too bad for outdoor play. Airplanes aren’t the only fun to be had when it comes to windy days. A sail boat can be equally fun to play with when it comes to the wind. The best thing about sail boats is you can make so many different kinds, which will allow children to explore the world around them. When it comes to making the sail boat, you can find all sorts of supplies around the house. For instance, a cork, toothpick and piece of paper will make an adorable sail boat that will quickly win races. Children can experiment with which objects float and so much more, which will help them learn quite a bit. When the boat is complete, they can easily race them in the wind. A pond, kiddie pool and so on are all you really need for this activity. Of course, if the wind picks up too much, you can also race these boats in the tub. Bubbles are a fun activity any day of the week. However, they can be even more exciting when it comes to windy days. Children can watch their bubbles soar through the air, which might create a sense of magic in them. Of course, you should definitely monitor to make sure your child isn’t going to end up with a face full of bubbles when they go out. If you want to save even more money on this activity, then you can make your own bubbles. You can also make own your bubble wands to add even more shapes and sizes to add to the excitement. One craft that might not initially cross your mind is prayer flags. These don’t have to be religious based if you choose not to make them so. Prayer flags tend to be a Buddhist tradition, but they can easily become your own family tradition too. All you need is colored fabrics to get started on this task. You can use the traditional colors and symbols, or you can make the flags entirely your own with your favorite colors and inspiring messages. You can choose from dying your own fabrics or using old clothing and more for the flags. Once you’ve completed your flags then hang them outside. They will create a beautiful setting all year round. However, when it is windy they will be particularly beautiful as they blow around. If they get loose then don’t fret. The hopeful messages you added to the flags will help to bring someone peace and joy. You never know, you might make a difference in someone’s life without even knowing it. When it comes to windy days, you’re bound to find some scientific fun that children will absolutely enjoy. You can base your experiments around your child’s age to ensure that they have fun while learning a lot of new knowledge that can help them in life. One great place to start is learning wind direction. There are a lot of experiments children can do in order to figure this out, but nothing works quite like wetting the finger to feel for direction. Your children might be interested in learning what exactly wind is and what it does, too. This is a great research project that can open doors to all sorts of new and fun activities. On top of that, kids can learn all about wind power. For instance, children might want to learn how it works or even try to engineer their own windmill to see how it works in a real-life setting. The science projects are endless, so let your children have some fun with it all. Even though there is a lot of fun to be had with the wind, there is also a lot of hazards involving it too. So, when the weather gets to be a bit too windy, you might want to go over the safety rules. If the wind is too high, make sure you go over safety procedures for shelter and when you should and shouldn’t go out. You should also go over criteria for tornadoes, because you never know when one might strike. Another concept to go over is first aid for wind related injuries. For instance, you might want to go over what you should do if you get dirt in your eyes and so on. This should help children and the whole family feel prepared when it comes to wind trouble. When it comes to windy days, you don’t have to let boredom take over. These easy tips will make the whole family enjoy the day while ensuring that you won’t have any complaints. With any luck, future windy days are bound to be fresh and exciting, opposed to a day where everyone feels confined to the home.